Real number between -1 and 1. Degree of the Legendre polynomial. degree must be nonnegative. Order of the Legendre polynomial. order must be nonnegative and less than or equal to degree. 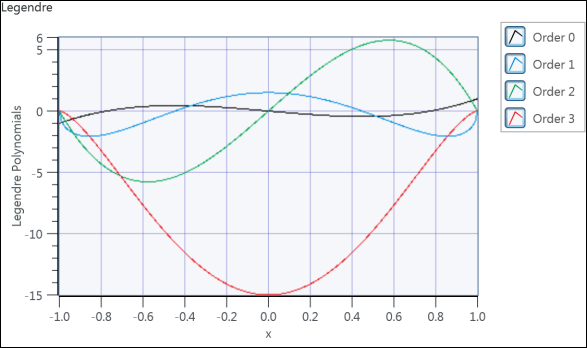 Standard 0 Computes the associated Legendre function. Semi-Normalized 1 Computes the semi-normalized Legendre function. Normalized 2 Computes the normalized associated Legendre function. Value of the associated Legendre polynomial of degree and order at point x. The associated Legendre polynomial of degree n and order m is the solution of the following associated Legendre differential equation. The following graph shows the associated Legendre polynomials of degree n = 3 and order m = 0, 1, 2, 3.